Earlier this week I talked about trying to paint the Minotaurs chapter symbol onto shoulderpads and decided it wasn't worth doing... at all. I figured the best solution would be to sculpt one and cast it so I'd have something to work on with my painting. Today it's time to see how that turned out. It turns out that Forge World has just released two very nice looking Minotaur character models. On these guys, there's plenty of surface detail to include the chapter icon. This makes it much easier to paint in the end. Think about it, which would be easier to do on your basic terminator squad: Paint all of the left shoulderpad terminator crux designs in freehand OR use have that detail sculpted on the model already and it being a matter of simply painting over that? This guy is Asteroin Moloc, the blood crazy Chapter Master of the Minotaurs. If you look at all the pictures Forge World put out of him, you can see all the great sculpted detail on the surface of the model. There is no need to freehand symbols and such. One interesting thing is the style of the armour... in particular the shoulderpads. While they are ornate, they are not the typical terminator shoulderpads we often see. These are from a much older mark of armour or maybe it's just an old type of artificer armour. Makes me wonder if Forge World may ever do older marks of terminator armour as they've done for power armour. There are lots of third party people doing it already. NOTE: Since writing this, Forge World has released this very thing. I have my thoughts on the older style armour and will be covering it in a post next week. The first thing I did was grab a blank shoulderpad and sculpt out the icon. I got myself a nice, thin and smooth layer of greenstuff over the top of the shoulderpad to work on and began to cut away the shape. I started at the bottom and worked up the side. I kept the other side similar so the shape was symmetrical in the end. Once I had the head sculpted, I waited for it to cure and then added the horns so I wouldn't destroy the head while trying to add them. I'm trying to get better with my icons and making them thinner and not as bulky. It's harder to do, but it gives them a much better look in the end I think. More scale appropriate if that's possible. Painting this thing was a breeze. I didn't even consider it while I was painting the bronze. I just worked right over it without giving it a second though. Once I had my bronze done to include the base color, shading, patina effect and highlights, I went in and worked on the icon itself. A quick basecoat of GW Foundation Mechrite red for the face and black for the horns was all it took there. I washed the face twice with GW Badab Black to pull out the detail (eyes and nose shape). 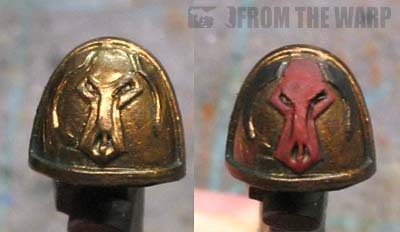 I highlighted with a bright red color and a fine line highlight of GW Bleached Bone for contrast. A final wash of Baal Red toned those down slightly and brought it all together. The horns were given a light grey blended highlight at the top to focus the highlight on the top of the shoulderpad. Getting your chapter icon onto your Minotaurs army is a challenge. You have lots of options though. From buying from Forge World to getting enough decals to freehanding or casting your own, it comes down to what you're comfortable with doing. Each method is going to have it's costs and good/bad points. You have to decide which one will work best for your budget and your taste. I'm going with sculpted, hands down. The speed at which it paints up in the end is night and day compared to how long it would take to apply a decal or freehand it in place. Sure, it's a bit more work on the front end, but it's well worth it to me. 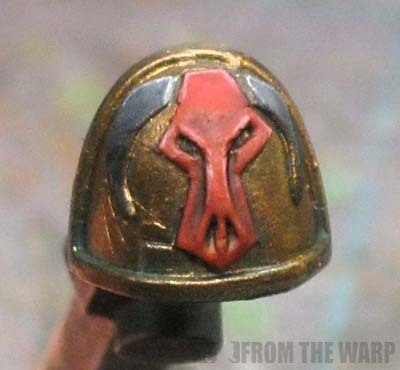 Figured as much after your article on painting the symbol. Doing it freehand would be an exercise in mounting frustration. Still, I suspect FW will release "official" pads eventually. @ Marcin: they already have; about 5 or 6 months ago. @ Somewhatdamaged: Really? It seems I'm not following FW releases as closely as I've used to. A world of difference indeed, not that the freehand wasn't good. This is just a few steps better! Looks really good Ron. 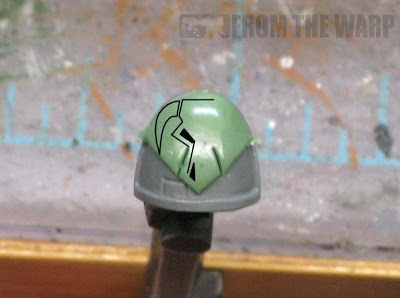 On shoulderpads I always feel like the raised chapter icons feel more real, being it would seem more likely that Space Marines would not just "paint" the chapter on there. Maybe I'm wrong though. Hephesto: Right, see... I said it would be. I didn't think it would be until about half way through painting it myself. Fayte: I bet the regular guys would have painted on designs and the Officers or guys with artificer type armour would have ornate designs bolted on. I actually like your take on the design better then FW. Kevin: It was my attempt at finding a balance between the GW version and the Forge World variation. After seeing what they put on those models, I felt a little bit more free to interpret the design. That combined with my skill level created the design you see on the shoulderpad. Nailed it!. Just a great job on that sculpt. Ron: If you have a small handful of those Novamarine or Minotaurs shoulder pads and still would like them cast up, let me know. I could use the practice. A glance through the SM codex suggests that many Marines would indeed have painted chapter markings. Veterans and officers tend to have raised logos, though. Us Ultramarines players are pretty spoiled. If we want raised markings for officers, sergeants, or veterans, we can just buy the plastic shoulder pad bit that comes with the Commander box. The sculpt is amazing, Ron. The best part is that not only was it easier for you to do than painting the logo free-hand, but it looks even better. As for the new FW Terminators, I'm just not overly impressed by them. They don't have the "walking tank" feel of the GW Terminators, but seem a lot more like bulky Tactical Marines. Myles: I only have that one shoulderpad and it's been painted already. I'm torn with what to do for my Novamarine shoulderpads. Jame: Well said about the new FW termies. BoH: Once you start, it opens a whole new world of modeling to you. I would try leaving out the nostrils. Will take a bit of the work out and im not too fond of them personally. I believe because they keep drawing my eye downward. Very nice though, i plan on doing minotaurs and i have to agree scuplted is the way to go in this case. As for the Tartoros pattern termie's, i think detailing is the issue. I have the same problem with the contemptor, just too much open space. 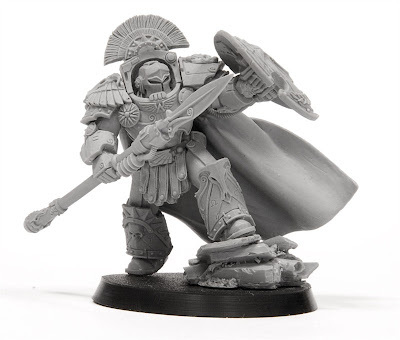 If you look at the minotaur chapter master though i believe he is in Tartaros pattern armour and he is pretty awesome. We are used to a much higher level of detail when it comes to FW. Death of Angles: Never thought about that... leaving the nostrils off of the nose. That would certainly give them a more stylized look too. As for the FW termie armour, you may have a point there. It is kind of bland for lack of a better word. At least compared to their other stuff.